See, Feel and Compare Magi Potholder Quality! Compare the Price and Applaud the Difference! Extra Thick! Extra High Quality! Magi Potholders and Mitts are Completely Quilted. All Magi Products are washable. Magi Bar-B-Que Mitts are Extra Thick using High Quality Percale inside and outside the Mitt. 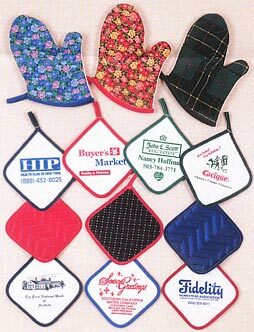 Magi has been manufacturing all cotton, "heavy quilted" Potholders and BBQ mitts since 1927. Ask for samples of our new 2009 line! Colorful, current, practical and useful. As popular as they are functional. Much in demand as a promotional giveaway and traffic builder, Christmas and holiday use. Magi is the ORIGINATOR of the Campaign Potholder for political candidates. Send us your logo or text and we will imprint it on your Potholders or Minnie Mitts. We also offer 6 Holiday Logos for you to choose from! ©2009 Magi Potholders. All rights reserved. Designed by: The Computer Company, Inc.